So today i have my very first Gosh to show you. To be compleatly honest, Gosh is really easy to get here in the UK but none of the colours have ever really stood out to me. Frou Frou, however was on sale as half RRP so i thought I'd givE it a go, espically with me on a shimmer/foil binge at the momnet. 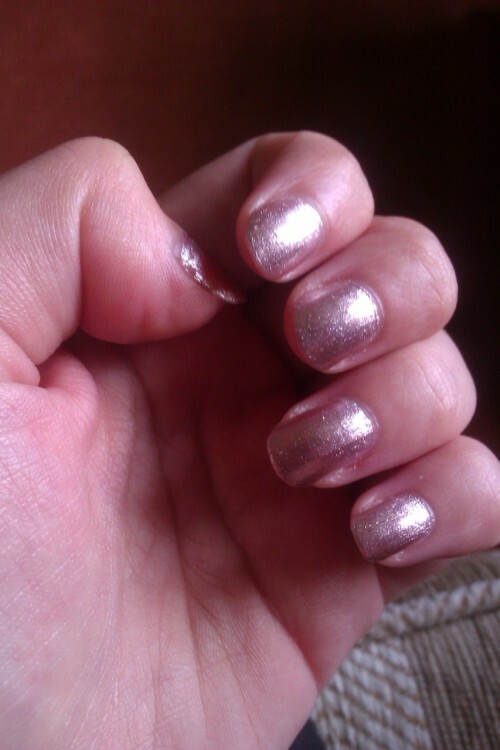 In the bottle Frou Frou looks like a rose matallic with silver hints however on the nail it looks almost copper and you only seem to see the rose tints in direct sunlight. It is very simular in colour in fact to Models Own Champagne which i reviewed a few weeks ago. I will try and do a side by side of it soon so you can compare the difference. Like i said the rose hints in this are very faint (this photo is taken in direct sunlight and it still seems kind of coppery to me). This polish is a lot more sheer than models own, i took 3-4 coats to build up a good colour on the nail. There is nothing wrong with this at all, it is a very pretty polish but it isn't what i expected. As i got this bottle on sale (and it was the last one there) i don't know if this colour is going to be discontinued. What are your experiances with Gosh?